Consider you’ve many more programs with stunning features and you’ve lost the product keys. What you will do? Don’t know? Don’t worry. In that scenario, your choice should be Backup Key Recovery as it is one of the efficient software that recovers the lost product key of the applications. 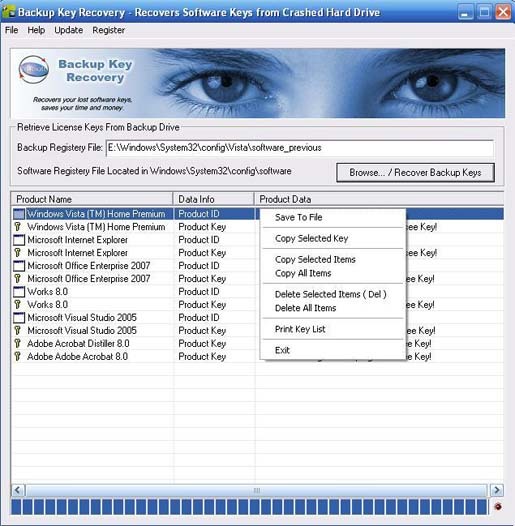 Backup Key Recovery retrieves product keys for Windows, MS Office, SQL Server, Adobe products and more than 2500 popular software products installed on your crashed hard disk drive. It is required to recover the registry files in the crashed hard drive before using this software. If the hard drive is damaged, you can connect it to the computer as a secondary hard drive and use the Backup Key Recovery software to browse and find the registry files located in Windows\System32\config\software and recover installed major software products activation keys. More than 2500 software packages are supported by the Backup Key Recovery.